It would have been a positive opportunity if some of the men that suffered sexual abuse at Mirfield had been invited to talk and discuss their feelings, and the feelings of others, at the Comboni Missionaries Chapter taking place now in Rome. That is what Pope Francis would have wanted, and that is what many priests and brothers of the Comboni Order want. It is what many of the abused want. In accordance with n. 147 of the Rule of Life, with joy and trust in God we officially convoke the XVIII General Chapter of the Institute. This act calls all of us to set ourselves on a journey of discernment, communion and prayer with the enthusiasm of Comboni, so that the upcoming Chapter may be for our Institute a grace-filled event and an occasion of renewal. The XVIII General Chapter will take place in Rome, at the General Curia. The Chapter Delegates will have to be in Rome by Saturday 29 August 2015 for a week of preparation. The Chapter will open on Sunday 6 September 2015 with a solemn Eucharist at 9 a.m. and its closing date is foreseen for Sunday 4 October 2015 with a solemn Eucharist. 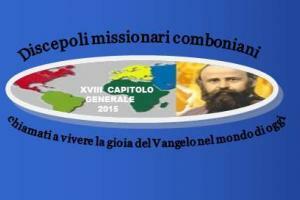 The theme for the XVIII General Chapter is: “The Comboni missionary disciples called to live the joy of the Gospel in today’s world”. Superior General, Fr. Enrique Sánchez González, and his Council. Chapter’s Documents: Letters of Superior General and his Council (Letter of Convocation, guidelines, lists of Delegates, and so on), Chapter Acts, and so one. Study works and essays concerning the General Chapter. The pre-Chapter commission: Fr. Rogelio Bustos Juárez (Mexico, coordinator of the Commission); Fr. José da Silva Vieira (Portugal); Fr. Miguel Pedro Andrés (Spain); Fr. Peter Ciuciulla (Chad); Fr. Joseph Mumbere Musanga (Congo); Fr. Dario Bossi (Brazil); Bro. Alberto Degan (Italy); and Fr. John Richard Kyankaaga Ssendawula (Egypt-Sudan). Time for discernment in the XVIII General Chapter in Rome. After the first phase dedicated to listening to what is happening on the ground in our institute, the Chapter begins the time of discernment in order to identify the priorities of our mission as combonis. Yesterday the “phase of seeing” has come to an end after listening to the reports which started on Thursday 10 September. The first report was that of the General council read by our superior general Father Enrique Sanchez, followed by the reports of the general secretariats and the Comboni Curia offices, and by those coming from the continents: Francophone Africa, America and Asia, Anglophone Africa and lastly Europe.